A few years ago, BYU Zoology Professor Duane Jeffery (now retired) announced that, "Amongst vertebrates, there is a sequence (in the fossil record) all the way from fish to humans." (BYU Daily Universe, June 5, 1996; see also Salt Lake Tribune, Feb. 11, 2006.) Some Church members have suggested that this explains the origin of man. 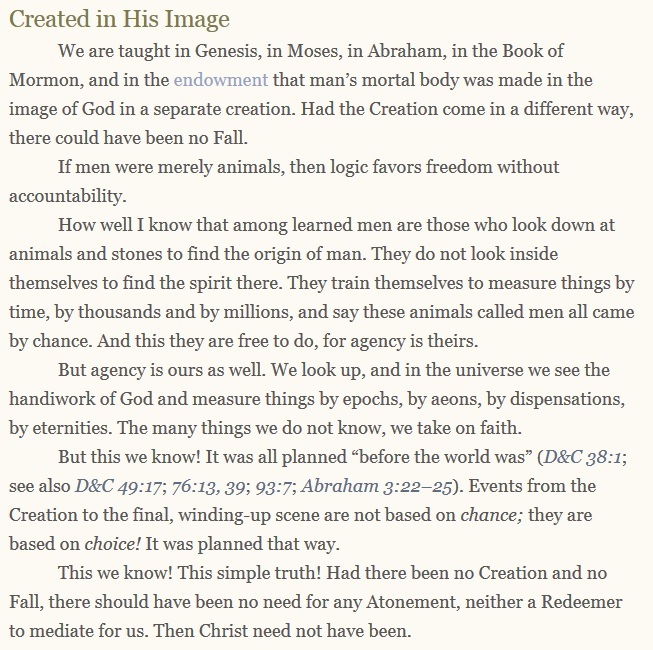 Currently, the Church's web site (JesusChrist.LDS.org) features Boyd K. Packer discussing "Who is Jesus Christ" and, in the process, explaining why we must look up, not down, to find the origin of man. "We are taught in Genesis, in Moses, in Abraham, in the Book of Mormon, and in the endowment that man's mortal body was made in the image of God in a separate creation. Had the Creation come in a different way, there could have been no Fall. "If men were merely animals, then logic favors freedom without accountability. "How well I know that among learned men are those who look down at animals and stones to find the origin of man. They do not look inside themselves to find the spirit there. They train themselves to measure things by time, by thousands and by millions, and say these animals called men all came by chance. And this they are free to do, for agency is theirs. "But agency is ours as well. We look up, and in the universe we see the handiwork of God and measure things by epochs, by aeons, by dispensations, by eternities. The many things we do not know, we take on faith. "But this we know! It was all planned 'before the world was' (D&C 38:1; see also D&C 49:17, 76:13, 39, 93:7, Abraham 3:22—25). Events from the Creation to the final, winding-up scene are not based on chance; they are based on choice! It was planned that way. "This we know! This simple truth! Had there been no Creation and no Fall, there should have been no need for any Atonement, neither a Redeemer to mediate for us. Then Christ need not have been." Thank you for this site as it very accurately shows that it really is official church doctrine that there was no death before the fall. I have tried to get member-evolutionist to see the light, but to no avail. My theory is that the extinction of the dinosaurs and fossil record was mostly created by Noah's great flood, which science also says did not happen. In order for evolution to be even remotely plausible it would have required a lot of time for mutation/natural selection to product the variety of life we see, so scientists make sure that everything they "find" and publish matches that story. If anything is found to suggest a young earth, or at least no death before 6,000 years ago, the data is quickly covered up and not published. I don't know how long God took to create the earth and how long it remained un-populated with animals before Adam and Eve were placed in the Garden of Eden. But it is official church doctrine that God created the Earth in a paradisaical state, calling it "Good" where there was no death. When Jesus comes again, the earth will return to this state (A of F 10) and there shall be once again no more physical death where Lions will eat straw and the wolf and the lamb will feed together. We believe that the fall occurred about 6,000 years ago, and D&C 77 and 88 says that there will be 7,000 years of existence after the fall and before the end; and since the Millennium will last 1,000 years, we know we don't have too much time left before Jesus comes. Whenever it is, it will come as thief in the night when the world least expects it. I'm so glad I found your blog. It is wonderful.